The site allows language learners and instructors to find partners for language exchanges either outside or during class hours. A language exchange is an agreement among two people to each help the other practice their native language. The new version includes communication via live-chatting or email notification, peer-corrected writing, and a badge/thank you system between users. Learners interested in a more structured approach can use the lessons integrating open content resources from COERLL at the University of Texas for French and German, the Cervantes Institute for Spanish, and Voice of America and British Council for English. Instructors interested in connecting their students can either have students find partners on their own, search for other teachers interested in doing a class-to-class exchange, or use the event feature. The event function is for those interested in students having a language exchange during a computer lab hour. 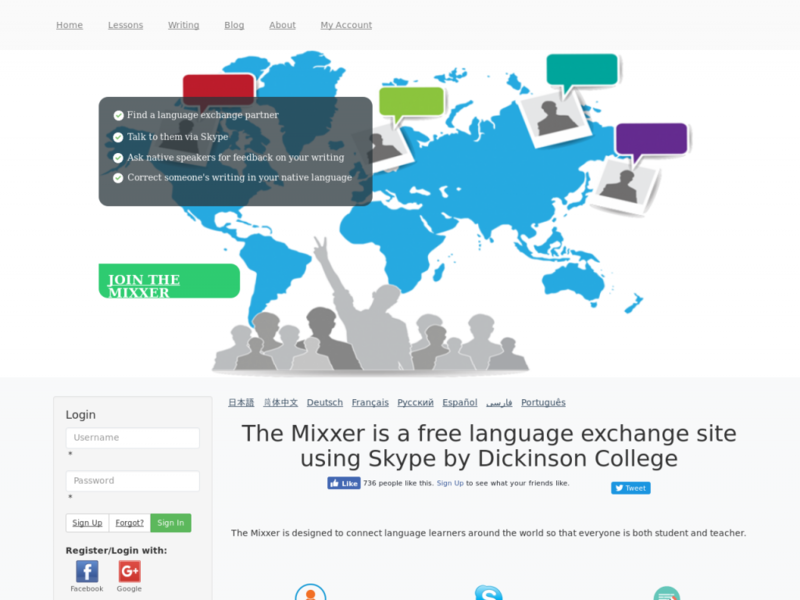 The instructor can send out an invitation to a sign-up page on the Mixxer website asking users matching a certain language profile if they are interested in having a language exchange with their students via Skype at a given day and time. At the time of the exchange, the instructor then assigns the registered native speakers to each of their students, who then call their assigned partner on Skype.